The Big Apple offers endless adventures. 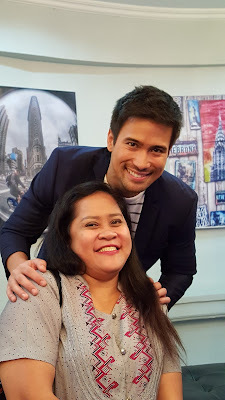 Regal Films' latest romance comedy flick The PreNup starring Sam Milby and Jennylyn Mercado will let us all explore the fun of laws in marriage and the beautiful places in New York starting October 14. Directed by Jun Lana with other cast members Dominic Ochoa and Ella Cruz, The PreNup Grand Press Conference was also joined by Regal Films' Mother Lily and Roselle Monteverde at Valencia Events Place last night. Also starring in the movie are Melai Cantiveros, Dominic Ochoa, Ella Cruz, Jaclyn Jose, Freddie Webb, Neil Coleta, Natalie Hart and Gardo Versoza. Jennylyn as Wendy felt the pressure of getting The PreNup as another blockbuster following her Best Actress portrayal in English Only Please by direk Dan Villegas. Sam Milby as Sean will have to convince parents Jaclyn Jose and Freddie Webb to compromise pre-nuptial agreements with gay parents Gardo Versoza and Dominic Ochoa. The movie promises another truly entertaining combination of wits and comedy plus marvelous tourist spots of New York. Watching The PreNup will take us to the Big Apple without having to spend a fortune. It is indeed time to laugh and reflect at our laws on marriage watching Regal Films' The PreNup on October 14 at all cinemas nationwide. For more information, visit http://www.regalfilms.com/, https://www.facebook.com/RegalEntertainmentInc and follow @regalfilms50 on Twitter and @regalfilms on Instagram for more updates.